DAT/EM CAPTURE collects 3D image features directly from the DAT/EM Summit Evolution stereoplotter into ESRI ArcGIS�. 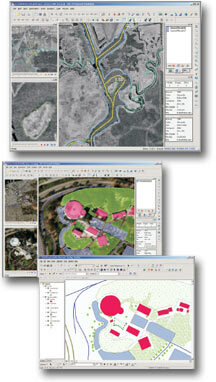 DAT/EM CAPTURE provides many data collection and 3D editing enhancements for ArcGIS. ArcGIS data superimposed onto stereo imagery, 3D digitizing tools such as convenient building squaring, and 3D editing tools such as 3D vertex dragging and field editing. In addition to digitizing new features, DAT/EM CAPTURE offers the ability to upgrade 2D data to 3D and check coordinate accuracy of existing 3D data. This enables you to easily view, edit, and add to your existing ArcGIS shapefiles and geodatabase feature classes. DAT/EM CAPTURE runs under the Windows XP/Vista/7 operating system and interfaces with ArcGIS 9.3.1. Compatible versions of ArcGIS are ArcView�, ArcEditor�, and ArcInfo�. Digitizing and 3D editing take place in the ArcMap� module of ArcGIS.